Fabulous Evans Purple Sequin Hem Crop Trousers Ladies NEW HOLIDAYS !! Ex Evans T Shirt ONLY £6.95!!!! Channel Islands, Isle of Wight, Isle of Man, Scilly Isles, Scottish Highlands, Scottish Islands and Northern Ireland. Great Service. Basic Tee in Blue. UK Size 14. Stretchy elasticated bodice with lots of give. Lovely quality. Evans PU Panel Leggings Black. These fashionable PU panel ponte leggings. Size UK 24. or dress up with heels and an embellished top. Machine washable. Inside Leg 27". BEAUTIFUL LADIES BLACK LINEN DRESS. RRP £65.00. Machine Wash. Size UK 26/28. Length 40". Knee Length. 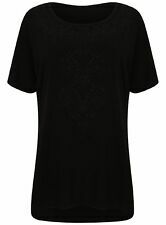 SHORT SLEEVE BEIGE BLACK TOP. make Supersized seem small. Sparkle Slogan Top. Slogan to front sayingGet Your Sparkle On. Glamorous and versatile grey sparkly slogan top with relaxed frill sleeves. Thin knit fabric. Round neck. Machine washable. Short, frill sleeves. Evans Black Floral Print Overlay Top. Black floral print pebble overlay top with 3/4 sleeve and black lining. Size UK 24. 97% Polyester, 3% Elastane. Machine washable. Navy Blue Stripe Tie Sleeve Top. 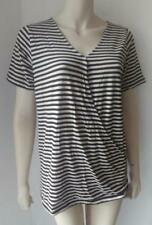 A navy blue and white striped top with. Size UK 20. Across the base is 24 ,stretching to 28". 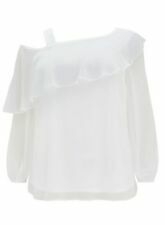 Ruffle Sleeve Top. Size UK 26/28. Lovely soft Evans Purple/Pink Ladies Sleeveless Top Ideal for HOLIDAYS !! Frill neck detail, lightweight fabric, ideal for this coming spring. Black Lace Bardot Dress. Evans Collection. UK Size 20. 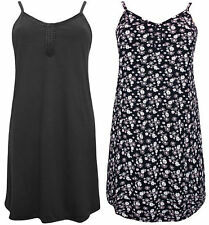 Evans Black Poppy Overlay Dress Size 26-28 rrp £ 55. Black short sleeve woven overlay maxi dress with a poppy print underlayer. NEW With tags.Evans stunning shooting stars tunic.size 22.